Chelsea fans lined the streets of west London as the team celebrated the club's historic Champions League and FA Cup double with a victory parade. 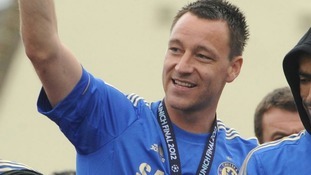 Players, including captain John Terry, showed off the Champions League trophy, which they won less than 24 hours ago in a dramatic penalty shoot-out in Munich. Jubilant fans waved flags as the open top blue bus passed by and players waved club scarves. When the players were given a microphone and asked to say a few words, Terry led chants of "Champione, champione, ole, ole, ole". The Blues were crowned European club champions for the first time in their history when they overcame Bayern Munich in their home stadium after the match went to extra time. Around 25,000 Chelsea fans packed behind one of the goals in the Allianz Arena, while many more crammed into bars in London and around the UK to follow the action live on TV. Even Prime Minister David Cameron managed to catch the nail-biting shoot-out, watching the drama unfold alongside German chancellor Angela Merkel and other world leaders at the G8 summit at Camp David. Didier Drogba was Chelsea's hero, scoring the equalising goal in the dying minutes of normal time and netting the spot kick to win the shootout 4-3. It followed his match-winning goal which saw the west Londoners overcome Liverpool 2-1 in the FA Cup final at Wembley earlier this month. At 34, Drogba is said to be leaving Stamford Bridge, so his winning goal could well be his last kick for the club. But the Ivorian star will certainly be immortalised as a Chelsea legend by the fans. Leaders at Camp David took a break from discussing the Eurozone to watch Chelsea become European club Champions.